Oregon Trip--Part two, chapter one. After my relatively brief introduction to the waterfalls of Umpqua National Forest, the rest of the drive back to Beaverton was relatively unremarkable. The four of us (Ben, Lori, Leo, and I) got back early enough on Sunday to hang out at their apartment pool for about an hour or so. Then, Ben and I headed over to the local Asian grocery to pick up some beer, some ingredients for homemade sushi (discussed below), and a Hawaiian delicacy called poke, a dish that Ben has been raving about. This is about the point of chapter one that I start speaking only in superlatives. For example, the meal we had that evening, Sunday, August 28th, 2011, consisting of a poke appetizer followed by round after round after round of homemade sushi (rolled by Lori) was the most I’ve ever consumed at one sitting. Ben and I ate until we were absolutely stuffed, and then we ate for like another hour after that. His facial expressions gradually evolved from satisfied to uncomfortable to exhausted to, finally, defeated. We were pathologically full. By all indications, it was an incredibly delicious meal, but honestly, I have no idea. As I mentioned before, I had caught cold during our weekend camping trip to Diamond and Crater Lake, and I was congested to the point of having no sense of taste or smell. So there I was, trying my best to keep up with the seemingly endless deliveries of sushi by Lori, and I couldn’t taste a thing. I can only hope that I get another chance in the future to relive it (well, about half of it). Superlative number two: That night, I got the least sleep I’ve ever gotten despite going to bed at a normal hour and getting up at a normal hour. I could not breathe at all through my nose, and my throat was sore and swollen, giving me a constant sensation of asphyxiation. I figure that I fell asleep between 5:15 am and 5:30 am. But that was it. The following morning, I was in sort of a zombie state. The plan was take Ben’s son Leo to his daycare and then hit the road toward the Oregon coast, but at some point in the wee hours of the morning, Ben’s car had been towed from his normal parking place because of failure to display his parking permit (the injustice of which is beyond the scope of this article), and we spent the next several hours on the phone and driving around the Portland area in Lori’s car trying to get it back; picture the movie Adventures in Babysitting, but without Elisabeth Shue. A few hours later and hundreds of dollars in towing fees poorer, Ben and I were on our way toward the coastal town of Newport, Oregon, where the real adventure would begin—a thirty-six-hour whirlwind tour of the Oregon coast, from the Oregon sand dunes in the south to Ecola State Park and Tillamook Head Lighthouse in the north, and all points in between. Our first coastal stop was at the Yaquina Bay Lighthouse in Newport. From there, we crept our way south along Highway 101 (one of the most beautiful routes I’ve ever taken), stopping to take pictures at nearly every state park, wayside, recreation area, lighthouse, scenic viewpoint, and “special interest area” that looked interesting. And there is no shortage of these; indeed, the 363 miles of Oregon coast has 80 state parks and recreation areas, about one about every 4.5 miles. So this means that almost all of the dramatic landscape/seascape along Oregon’s coast is actually accessible, rather than locked up as private property. Why aren’t there more places like this? Of all our stops during that initial trip south on Sunday, we probably spent the most time at Seal Rock State Wayside and Cape Perpetua (or at least those are the places I remember most distinctly). The latter was especially impressive; a precipitous walkway leads down to a powerful scene called Devil’s Churn, where a long split in the coastal rock channels each incoming Pacific wave, and violent explosions of seawater are common as swells collide with each other and the surrounding rock. I did my best to negotiate the sharp, wet rocks with my tripod and camera (10-stop filter attached) and to stay just outside the reach of the spray. The only real items that pressed us for time toward the end of the day included stopping for clam chowder at Mo’s in Florence (Ben was right; it was delicious) and making it to Jessie M. Honeyman Memorial State Park in time to get the keys to the yurt Ben had reserved for us. If you’ve never seen or heard of a yurt, it’s equal parts tent and cabin. Ours even had power! We knew that our camp site would be within walking distance of the Oregon sand dunes, and we were excited to head there for some sunset photography, but it was a bust. After climbing one of the tallest and steepest dunes imaginable, we found a relatively uninteresting view of a snowmobile area. 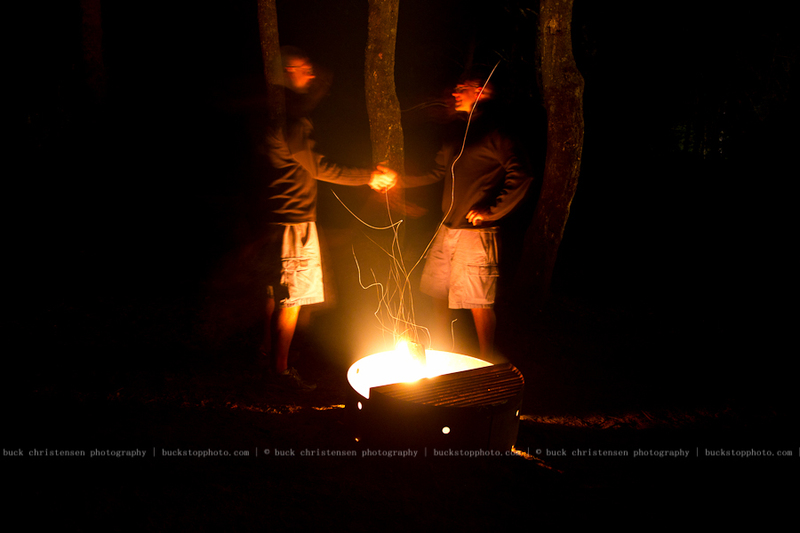 So back down we went, to start a fire at our campsite and to have a few beers. What followed must have been an interesting/annoying (entertaining?) 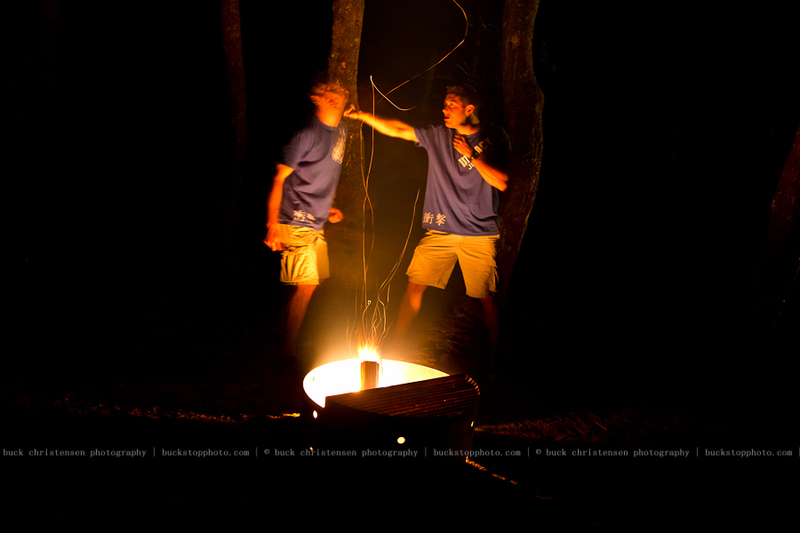 experience for our neighboring campers, as we photographed ourselves by the light of the campfire with long exposures. Explaining them would do no justice, so I included a few examples below.